Wasabi backup means utilizing the Wasabi S3 cloud either for backup its content or for storing some data on its bucket. Handy Backup provides a mighty and easy to use S3 cloud backup plug-in, which allows performing both these actions, as well as restoring data to Wasabi cloud after backup to other place. All parts of a Wasabi backup task are highly automated; from making a new task to creating a connection with a Wasabi cloud storage to running a task at a particular scheduled time and repeating it as frequently as you need. Handy Backup will do most of the routine operations for you automatically. Besides built-in encryption and compression, Handy Backup fully supports a secured S3 protocol when transferring data to and from Wasabi storage service, and allows using much more secured protocols for other types of data storages. You can also use external utilities before or after a Wasabi backup task. Use Wasabi storage for any type of data to back up. Make full or partial (i.e. incremental and differential) or mixed full/partial backups. Store different versions of the dataset, make time stamps, compress and encrypt your backups to a Wasabi cloud. 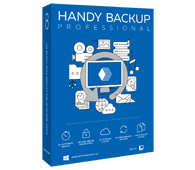 Handy Backup provides it all – and much more! With the S3 plug-in available out of the box, the Professional edition for advanced users and mighty workstations allows Wasabi backup to and from, with all functions needed for a user-level PC backup! Open Handy Backup and call a New Task Wizard by clicking a new task button on the panel. Select Backup task on the Step 1. Click "Next" to move to the next step. On the left panel of the Step 2 window, choose the S3 Cloud option in the "Cloud" group. Click on the ">>" button, or double-click onto a plug-in name. The new window will appear. Here, double-click on the "Create a connection" option. Server name. Enter here a name of the Wasabi storage: s3.wasabisys.com. Access Key. Enter your Wasabi storage access key. Secret Key. 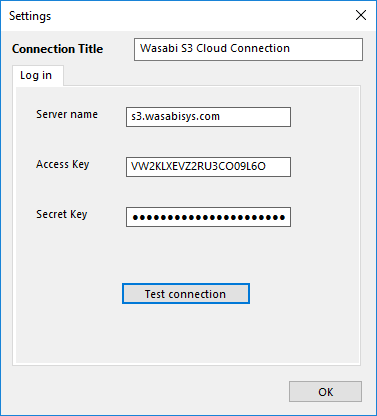 Enter your Wasabi S3 secret key. Test your connection, and then click OK to return to the plug-in window. You will see the list of Wasabi cloud files. Mark the checkboxes against those data that you will plan to save. Then return to the task wizard by clicking OK.
On the next step, select a storage destination for your particular Wasabi backup. Proceed. The Step 4 is for advanced settings. Here you can select time-stamping, partial backup, keeping many versions etc. The fifth step is for compression and encryption of your Wasabi backup files. Note: Handy Backup stores uncompressed and unencrypted backups in original data formats. This allows you using, modifying or even restoring the Wasabi S3 backup files manually through other applications such as file manager, without a need for complete restoration. Schedule your task on the Step 6 to an exact time and repeating period, or trigger it by some system event. Finally, give a name for your Wasabi backup task and finish the task wizard. 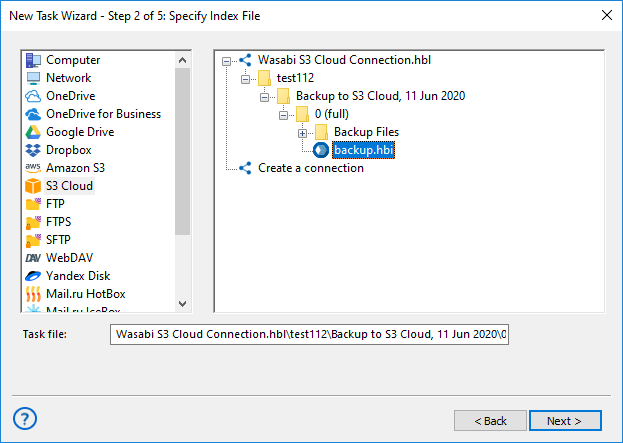 To save your backup information to a Wasabi S3 storage, please select it as a destination on the Step 3 of a backup task. Select the S3 Cloud plug-in on the Step 3 as the backup destination. 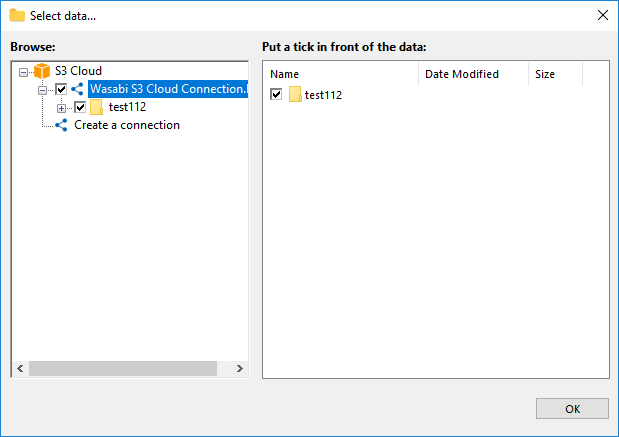 Create a new connection as described above, or choose an existing connections for a particular Wasabi storage. 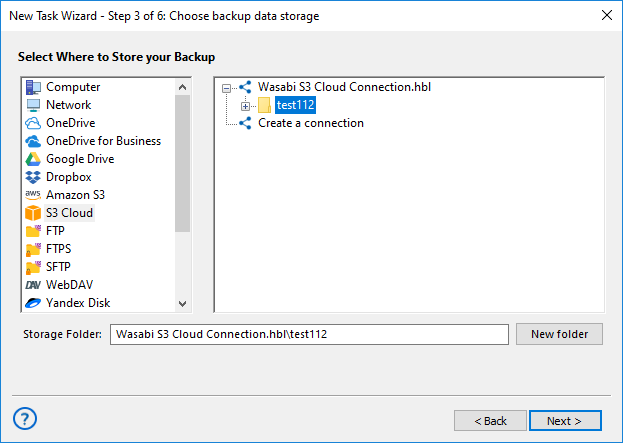 After completing a configuration for Wasabi S3 storage, just choose a folder to serve as your backup destination, and then click OK. Continue creating a backup task as described above. There are no any specific limitations or options to back up to Wasabi storage. 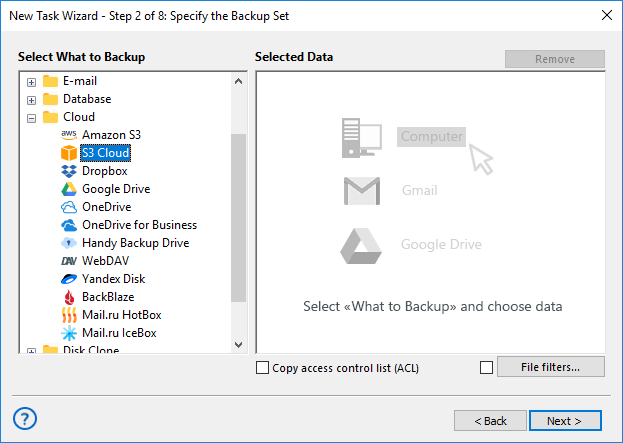 On the Step 2, select "S3 Cloud" as backup storage. Choose an appropriate connection. On the connected Wasabi storage, please find a folder that contains your backup data. Choose a place to restore your backup data from the Wasabi S3 service. Continue creating a recovery task step by step, as according to instructions given at the User Manual. Handy Backup is a simple but mighty tool for Wasabi backup and recovery. Experience its might by trying a full version of the program by a 30-day free trial period!